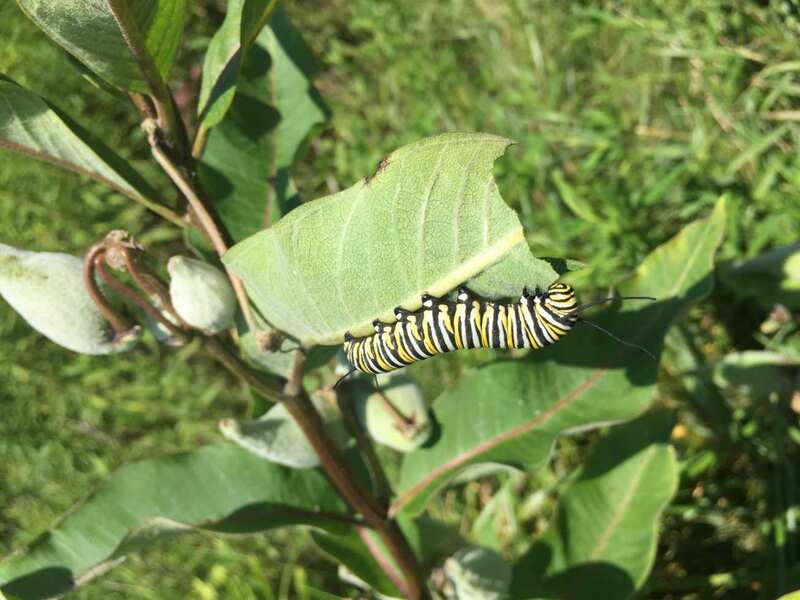 Monarch caterpillar enjoying a milkweed feast–they know the good stuff when they see it! I love the summer months for foraging wild foods. One of my very favorite wild foods is Common Milkweed (asclepias syriaca). Around here, the pods are just beginning to form–and its a great time to explore this delightful wild food. 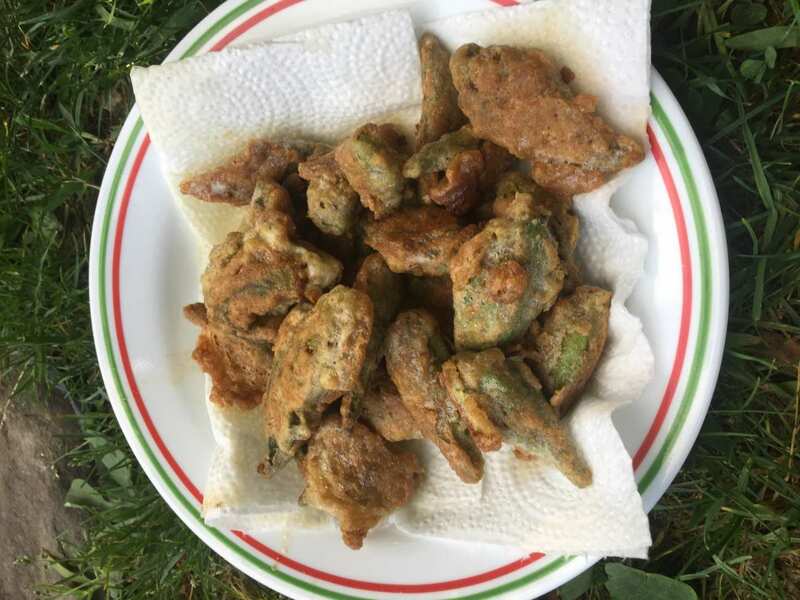 They have a light vegetable taste, maybe something like a sugar snap pea–very tasty and delicious. In fact, this is one of the best wild foods, allowing you to have four different harvests from the plant at four different times during the spring, summer, and early fall. With the excitement of harvesting from common milkweed, however, comes a serious responsibility. New farming techniques over the last 20 years have eliminated many of the hedges that used to be full of milkweed. Because of this issue, the monarchs have been in serious decline. 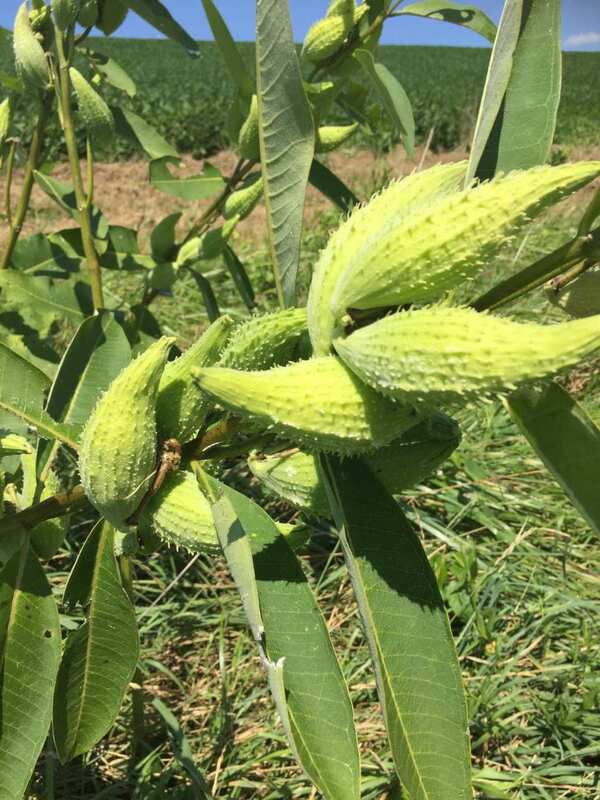 When I teach this plant during wild plant walks, I tell people who want to eat milkweed that if you want to do so, you have to do your part first. Given the decline of monarchs and milkweed, it is necessary to first propagate it. This is my suggestions: find where the milkweed grows in year 1. Observe it, see the monarch larvae enjoying the leaves. In the fall, come to the patch and harvest some of the seed pods (not all). Scatter some seeds just beyond the current patch. Then, scatter them in at least 4 new places that will be good for milkweed. 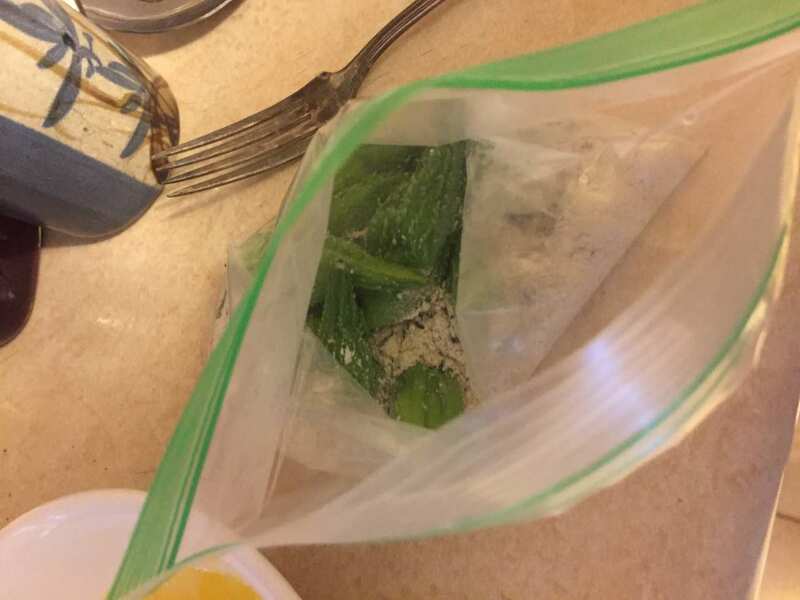 If you have land, save seeds and start them in the spring (put them in the fridge for a few weeks before planting; they need a few weeks of cold stratification). If you don’t know where milkweed is at all, order some seed online and start a patch. Plant them in your veggie garden or along your house or in a community garden plot–they are a vegetable! In year two, once you’ve established a new milkweed patch and have scattered the seeds, it is now ethical to harvest some (but not all) of that patch. Keep spreading the seeds anywhere you can. We need a lot more milkweed out there. So for every plant you harvest from, you should be planting three more! This is what reciprocation is all about–we can eat delicious vegetables from nature, but while we do so, give back more than we are taking. Every year, I suggest scattering more of the milkweed seeds and getting others to grow them. We can all do our part to help these amazing butterflies and plants continue to thrive. I think doing whatever you can to create more milkweed is necessary before harvesting it. This creates a positive relationship with the plant, shows you are ready to give before you are ready to take, and honors the spirit of both the milkweed and the monarch. Ok, so assuming that you’ve done your due diligence to ethically harvest this plant, let’s talk about how great it is to eat! Milkweed offers four opportunities to eat different parts of the plant as the season goes on. Shoots. The shoots in the spring are the first harvest you can enjoy from this plant. If you harvest the shoot, obviously, the rest of the plant won’t be there for the monarchs–so again, being sustainable in your harvesting and cultivating new beds of milkweed in places you have access to is really important. You can harvest these like bamboo shoots or asparagus–cut when young, usually around 6″ or so, and steam or saute in butter. Delicious! Flower Heads: The unopened or slightly opened flower heads are the second harvest, occurring about a month after the shoots take off. For my bioregion, this is usually early to mid June. 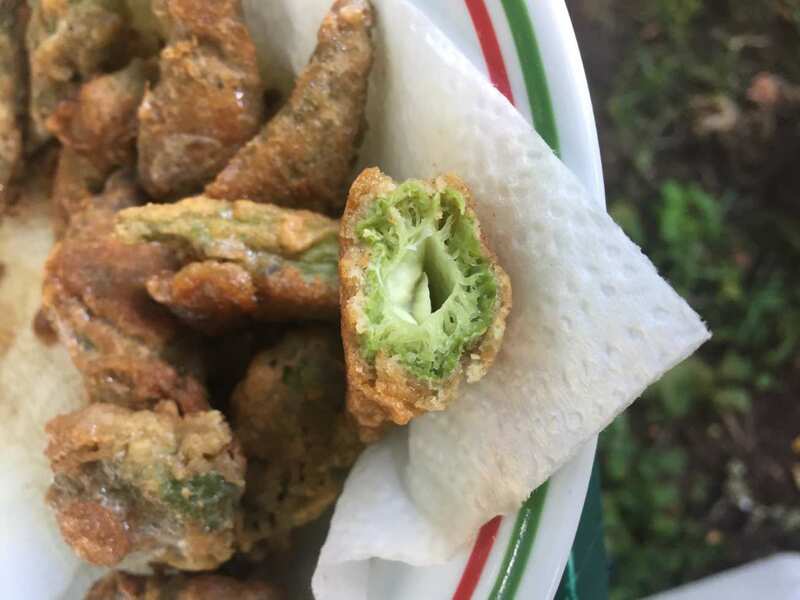 The flower heads can be treated just like broccoli–steamed, sauteed, or batter dipped and fried. 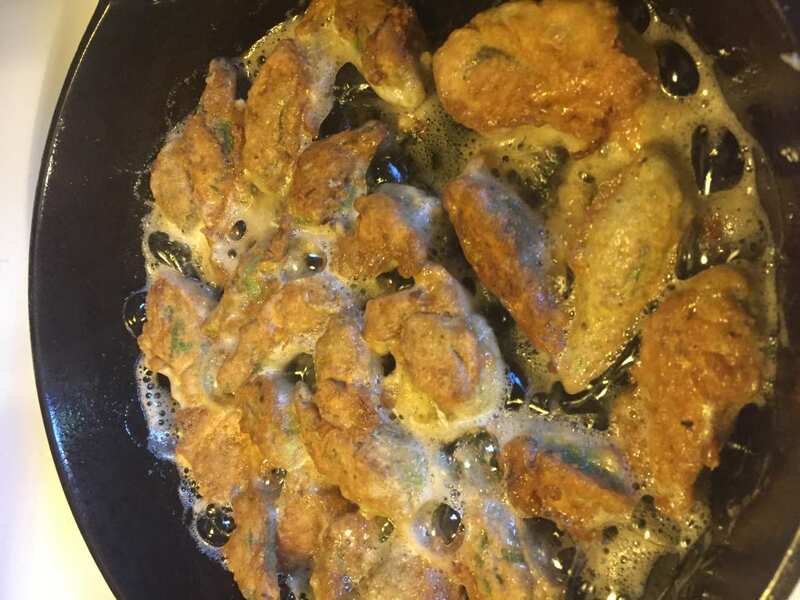 I like to dredge them in cornstarch and some salt and herbs and give them a flash fry. Delightful! Pods: My favorite harvest from milkweed is the flower pod. You want to look for the immature pods, 2″ or less across. 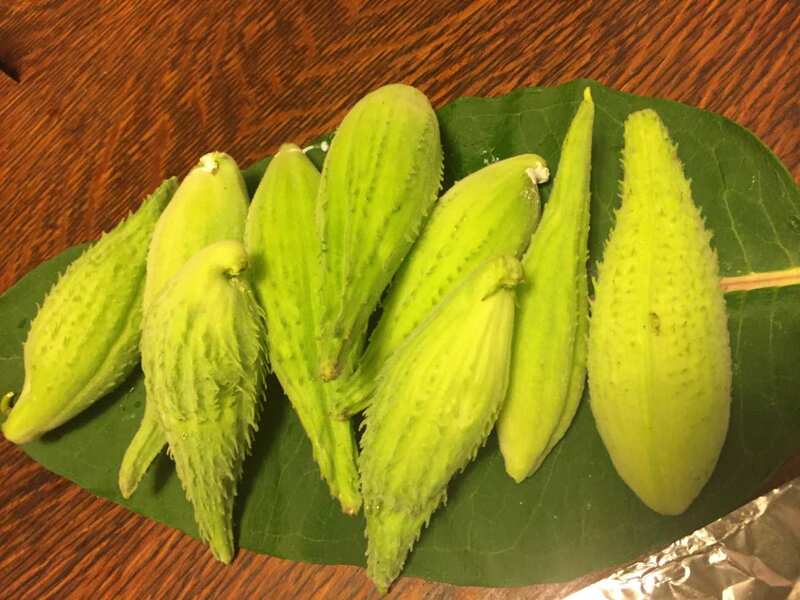 You can eat the whole pod, and treat it pretty much like you’d treat okra (but I think okra tastes nowhere near as good as Milkweed!) Remember when harvesting these, you are preventing the plant from going into seed, so harvest selectively and ethically. Silk: Probably the most unique harvest is the silk; this comes from more mature pods before the seeds go brown. You would remove the outer pod (which as it gets bigger, it gets tougher, which pretty much applies to any green vegetable!). Once the outer pod is removed, you can pull out the inner silk. These can be baked into dishes or steamed–they literally get stretchy and taste kind of like a vegetable-flavored mozzarella. I know that sound weird, but its super good. 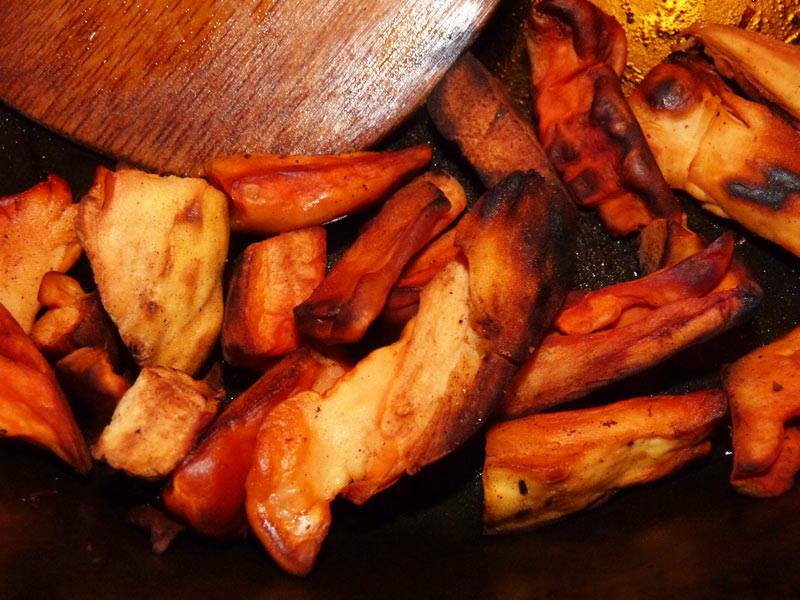 I’ll now walk you through one of my favorite ways of preparing this delicious vegetable. First, find yourself some milkweed pods that are 2″ or less in length. I wrapped mine up in a leaf when I was out and about and checking on a patch I had been cultivating for some years. Usually they don’t need washed or anything, but you can check and wash them if its appropriate. 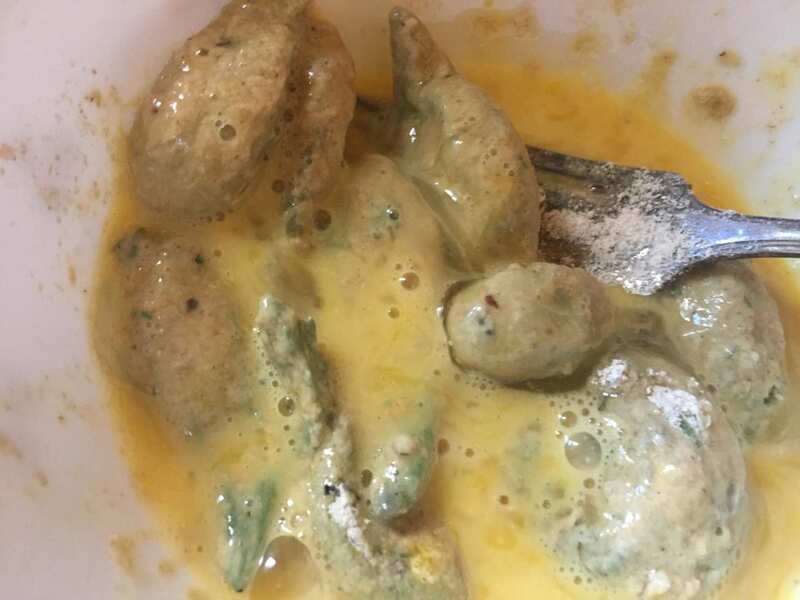 Next, you dredge them in flour or cornstarch. A plastic bag or bowl works great for this. I like to use a bag and just shake it up with them inside. Then, you heat some frying oil in a pan (I am frying in olive oil, but you could do others) and when the oil is hot, pan fry them. I prefer to use an iron skillet for this for even heat. Next, you drain them on a paper towel. 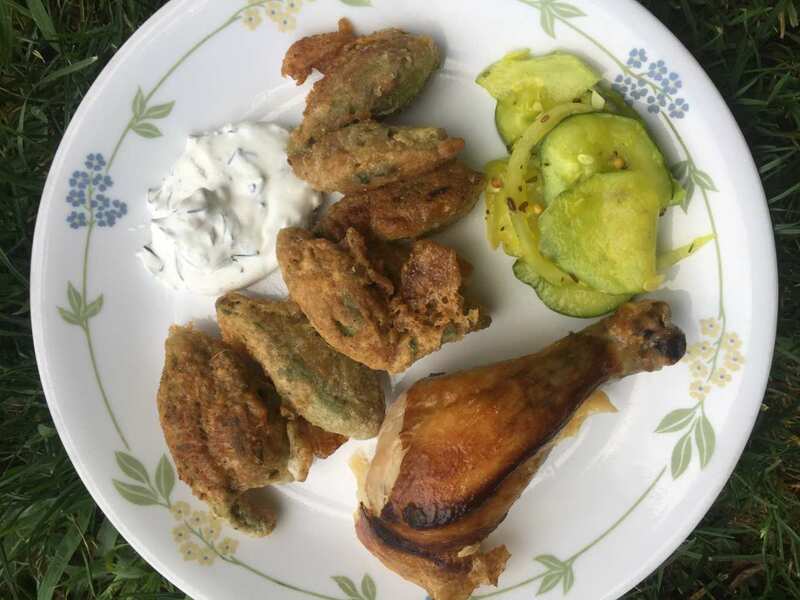 My family enjoyed them with chicken, homemade refrigerator pickles, and a nettle-dill dip dip (which I posted a recipe to sometime before). Take a bite and enjoy! May your milkweed seeking and cultivation be fruitful and the land be abundant! 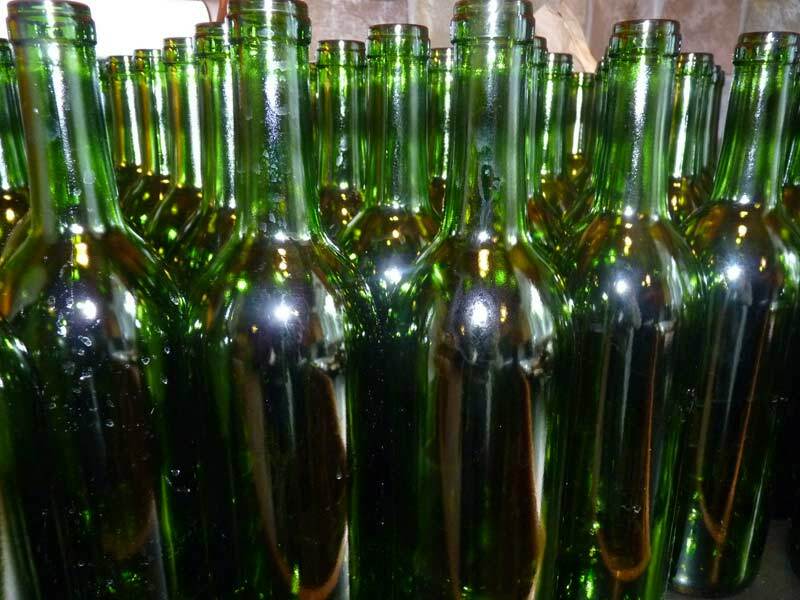 I’ve posted on Dandelion wine before on this blog, and I wanted to follow up on my previous posts on dandelion wine – making the wine and racking/bottling. I’ve also written more generally about the dandelion as a beneficial plant–so why not 4th post on the glorious dandelion! In this post, I wanted to spend some time talking about dandelion, review the last two years of dandelion winemaking adventures, share two new recipes, and talk about some flavor tests. For basics in how to make dandelion wine, please refer to my first two posts on the subject (linked above). I want to speak briefly about the spiritual side to brewing dandelion wine. First of all, dandelion is a plant that so many hate and eradicate. Many poison the land to get rid of it–instead of learning about why its growing, what it does for our landscape, and how it may benefit us and wildlife (see photo below). By reclaiming this plant in various ways, we help heal the abused relationship that humanity has with dandelion and deepen our connection to the land. Its also fitting that dandelion is a very medicinal plant–healing the digestion and clearing the liver, primarily. And digestive issues are plaguing so many, especially because of industrialized food. I also think that from a sustainable perspective, we take something that is unwanted and turn it into something that is very wanted–alcohol. What a way to reach out to people–through wine! I am convinced that if I share enough bottles of the stuff, I can convince people to treat their lawns and dandelions just a little bit differently–and so I keep brewing the wine. For these reasons, I love dandelion in all her forms, and I love the wine, food, and medicine that she creates. 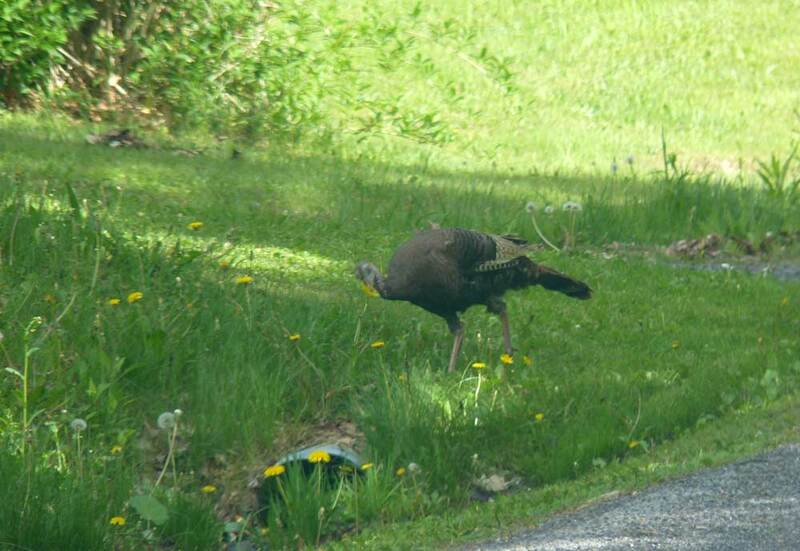 Wild Turkey Feasting on Dandelion – Wildlife need the dandelions too! This recipe makes a 5 gallon batch, which is well worth making. You can reduce this to 1 gallon if you want by dividing everything by 5. A 5 gallon batch gives you approximately 24 bottles of wine, enough to drink and share! Pick the flowers on a sunny day when they are open and full–you usually have about a week window of time to pick before they go to seed (in my part of the country, Zone 6b, this is usually early in May). Do not pick the stalks, but a bit of greenery around the head is fine. Using a VERY large vessel or several smaller ones (I use my pressure canner and huge stockpot, you could also use a brewing bucket), boil 4.5 gallons of water and pour the boiling water over the dandelion flowers. Cover with a towel and tie the towel to the pot using string or yarn (see my earlier post for photos). Let it sit for two days, stirring three times a day. You’ll see it start to ferment and start to smell like wine after a day. After the two days, bring flowers and water to a low boil (you will likely need to split the batch into two pots to do this). Thinly peel or grate oranges and lemons (avoiding any white pith), and cut up the ginger into small chunks, and add to the mixture. Also add the sugar at this time. Boil for an hour, then let cool to lukewarm (70-75 degrees Fahrenheit) and pour back into your brewing bucket, cover, and let sit in a warm place for three days. 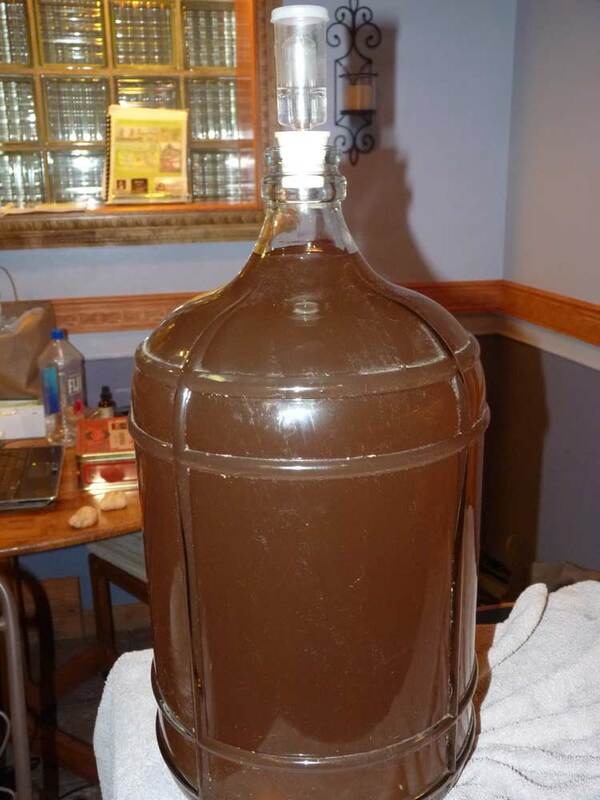 Then, strain your dandelion mixture and put into a secondary fermentation vessel, like a 5 gallon glass carboy. Add all of the raisins (I do this with a funnel–and its tedious), top off the carboy with water till its 3″ from the top, then fit with the fermentation trap. You’ll see the yeast going crazy over the sultanas–it’s really fun to watch. After a month or so, the wine will clear (that is, everything, including the sultanas and yeast, drops to the bottom and the wine gets much less cloudy). Strain and rack, again topping up with any additional water to get 3″ from the fermentation vessel. Wait another month or two till fermentation ceases completely, then rack again, again topping up with water. Wait another two months or longer, then bottle. At this point, you are about six months in–bottle it and wait another six months before tasting. If you wait even longer, it will just continue to get better and smoother with age. Sometimes, we forget to bottle it and even if you leave it racked, it ages and tastes really good by the time we bottle it :P.
The addition of the ginger in this wine is awesome–its smooth, complex, sweet, and quite alcoholic! Its seriously some of the best wine we’ve ever had! This wine has less of a complex flavor than the Dandelion-Ginger above, and it has just a tiny hint of bitterness from the dandelion–which is a fantastic thing for after dinner to get the gastric juices flowing (bitter flavors stimulate digestion). So we see this as a really medicinal and fantastic wine–herbalist approved :). Its doesn’t get as clear as the Dandelion-Ginger wine, but its still sweet, strong, and wonderful. Follow all directions above, omitting the ginger, oranges, lemons, and sultanas. Ferment and enjoy! Dandelion Bitters Wine ready to bottle! All three wines (including the original dandelion wine recipe we tried two years ago from Jack Keller’s site) taste great. We like the Dandelion-Ginger Sunshine wine the best because the ginger gives it a really nice flavor, not too strong, but just adding that little amazing extra zing to make it an A+. But any of the three are great–and the longer they sit in the bottle, the better they get. I still have about 8 bottles left from 2013, and they are seriously so amazing (and a very hot commodity when people find out you have it). Here’s a photo of the difference in the color and clarity between Dandelion Bitters (left) and Dandelion-Ginger Sunshine (right). The Dandelion-Ginger Sunshine wine really clears nicely. As my bottles safely age in my pantry, I am once again reminded about the lessons that time and patience bring. I hope that more people take up brewing with dandelions (or cooking with them, or anything else)–its a great alternative to mowing them or spraying them with chemicals. If we can get enough people to do this, dandelions will be cultivated once again in our fields and lawns, rather than hated. And then their sunny, golden heads can serenade the spring! I’ve been spending a lot of time talking about various wild foods and other kinds of wildcrafting and foraging on this blog, and I wanted to talk today about the principles of wildcrafting and ethical foraging more broadly. This post is the first in a series of two that focuses on introducing the reader to how to effectively wildcraft/forage, and is built upon my extensive experiences foraging and wildcrafting, which I have been doing in some form since childhood, but which I took up quite seriously about 7 years ago. This post offers definitions, supply lists, resources, what and how to learn, and information on timing. My second post in this series will discuss locations, avoiding environmental pollutants, and ethics. 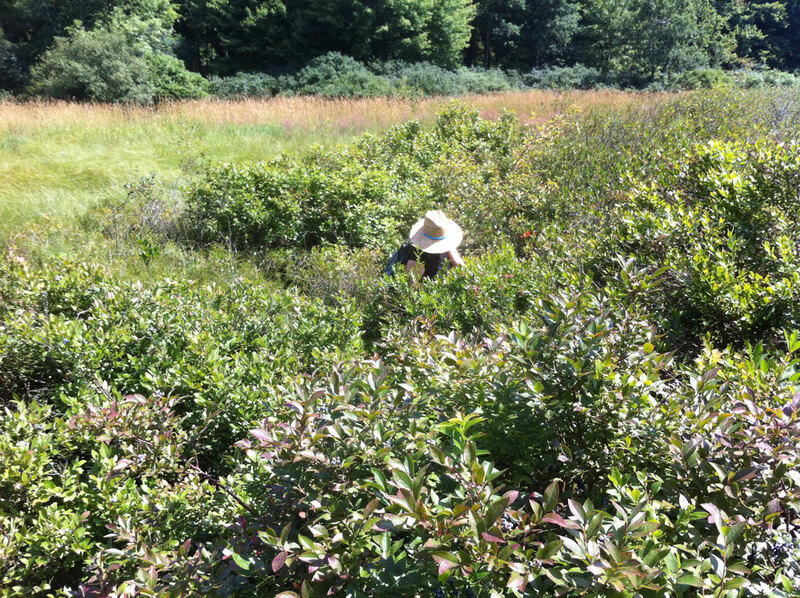 Deep in the blueberry bog–an abundant harvest! Defining Wildcrafting: Wildcrafting is a modern term for an ancient practice. For as long as humanity has existed, we have gathered from the natural world for our food, shelter, medicine, clothing, ritual items, arts, and much more. Wildcrafting today refers to gathering materials from the land that you will use for various purposes, most frequently food or medicine, crafts, household items, natural building, carpentry, ritual items, clothing, and more. I often see the term associated with medicinal herbs, but there are many other possibilities for the wildcrafter. Non-food uses of wildcrafted items that I’ve covered in this blog include wildcrafted medicines such as jewelweed salve or various medicinal tinctures, smudge sticks, inks, baskets, and incense. Defining Foraging: Foraging is a type of wildcrafting that is specific to finding food: wild food foragers hunt for food throughout the year (and I’ve covered many of my favorite foods one can forage for: burdock, black raspberries, violets, ramps, chicken of the woods mushrooms, and autumn olives, to name a few). Other associated terms you might hear are bushcraft (a term for a variety of wilderness skills, such as shelter building, trapping, or fire making) and woodcraft (another term for skills associated with the woods). Abundant harvest of black raspberry–one of my very favorites! This is a good question, and one that I get asked more often than one might expect. For me, wildcrafting and foraging have numerous benefits, many of which are not material. First, as a druid, I enjoy spending time in nature, in stillness, in focus, and simply enjoying the natural world around me. Wildcrafting gives me a good reason to get myself into the forest and the fields as often as I can. Second, I’ve been talking a lot on this blog lately about reskilling; developing the skills necessary to transition to a sustainable and earth-centered future. Learning once again to live off of the land, to live in harmony with the land, and to take only what is necessary is an important part of that path. This is what our ancestors did–and this is what we will again do–if we can learn to do it correctly and in balance. Third, I really enjoy the tangible benefits–the medicine, the food, the various craft items. I have tasted more new things and have been able to heal myself right from the land around me–these are empowering things. Knowledge is critical to this path. Not only knowledge of what you can take and use, but also knowledge of how that taking impacts the ecocystem. And ethical forager is a knowledgeable one, connected to the land, and knowing their impacts. So throughout these two posts, I’m really going to stress that you need knowledge to do this effectively. Foraging Bookbag. When I got out foraging, I have a special “foraging” bookbag that I take with me with some basic supplies that are useful for finding food, medicine, and other kinds of things. The bag was one I purchased at a yardsale for 50 cents; it needed some minor repairs but works great. Essentials that are always in the bag include sunscreen, an essential-oil based bug spray, fire starting equipment, an energy bar, a can of pepper spray, a hat that easily folds up, a compass, fire-starting equipment, and basic first-aid supplies. I also bring water; usually I don’t bring much in the way of snacks because I can always find a few trailside nibbles (that is, unless I will be out for some time and then I will bring some other stuff). Tools: The Hori Hori. If you are only going to have one foraging tool-this should be it. Its a Japanese gardening tool that has a serrated edge, a sharp edge, and can dig and cut. I won’t leave the house without it! I purchased mine for $30 and its one of the best purchases I’ve ever made. Other Tools in the bag include a small hand saw that folds up to about 7″ in length; my hori hori of course, a pair of scissors, a smaller knife, and a pair of gloves. These are all fairly light. If I’m going out for roots or tubers (like cattail, ground nut, or burdock), I might take a long a little fold-up shovel or even a garden fork if I’m not going far, but those are quite heavy, and I add these only when I need them. The knives are for cutting various plant matter or mushrooms; the hori hori can be used for cutting and also be used for digging roots or limited sawing. The hand saw is for getting branches or barks (useful to cut up roots from a fallen sassafras tree, for example). The scissors are good for harvesting smaller plants or greens, such as yarrow or nettle. I usually use the gloves for harvesting stinging nettles, which I take every opportunity to get when I go out in the summer. Storage. 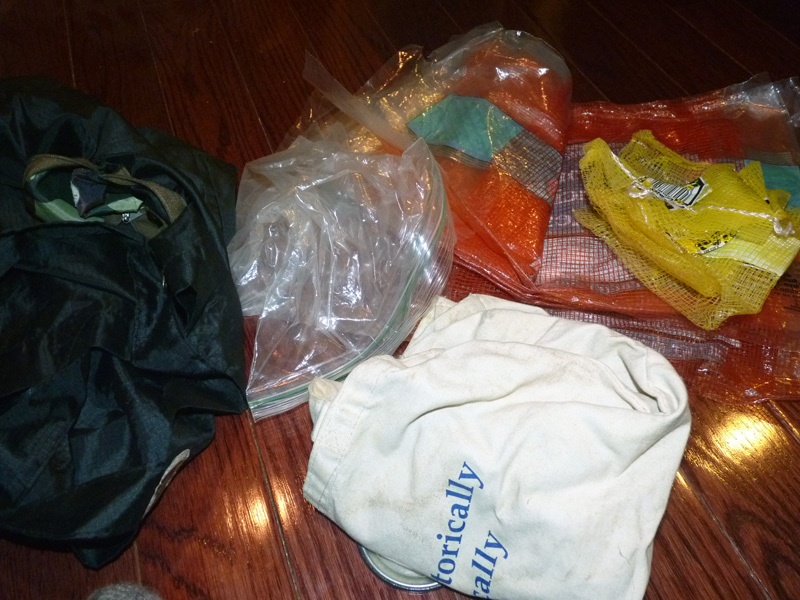 The foraging bag also holds many different kinds of smaller bags for bringing things home–a few larger canvas bags for nuts or mushrooms, a few mesh orange/lemon bags (particularly good for mushrooms because it allows them to breathe), plastic bags of various sizes that I re-use, and paper bags of various sizes. I keep all of these materials in the bag and then when I want to go out (usually at least twice a week in the summer). Blickeys. If I’m going berry picking specifically, I may also bring a blickey or two (see photo), which can be created from a gallon plastic jug. 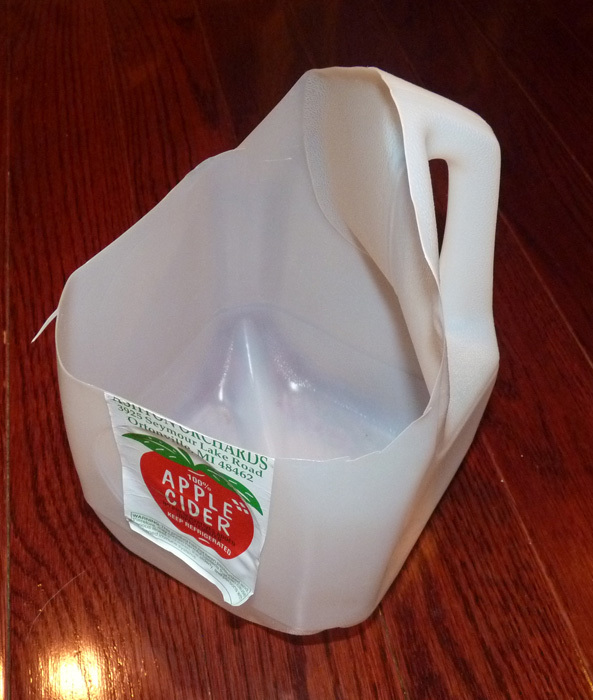 You just cut part of the top off of the jug, so you can easy place things in. You leave the handle intact, which can go around your belt. They are super lightweight and free to make. If you don’t drink anything that would have them, a quick trip down your road on recycling day is sure to procure an abundant supply. Because I have a friend with a severe dairy allergy that I often share wild-harvested treats with, I only use ones that had water or apple cider (like the one pictured), not milk. So keep that in mind when making your blickey. Clothing for Foraging. I also always make sure I am wearing long pants and a belt; sometimes I will also include a hat for the sun and my muck boots if I am going into swampy areas. Long pants are a great idea year round–in the summer they can protect you from poison ivy (even the most experienced wildcrafter sometimes wanders into a patch unawares–like the time I was enthusiastically harvesting St. johns wort and realized that underneath the top layer of plants, there was a lower layer of poison ivy–thank goodness for the jeans and muck boots!) For shoes I will wear hiking boots or the muck boots (the muck boots are really hot in the summer). The belt can hold a blickey or my hori hori or both. Company for Foraging. I have found that foraging is much more fun with a friend than by one’s self. If I mention to some people that I’m heading out for a few hours, I almost always can find someone who wants to come with me and see what’s out there. Other Resources. I usually take one or two field guides with me (see the next section for ideas), depending on what I’m going for. Since I’m still learning mushrooms, in the last two years, I was usually carrying a compact mushroom guide and one or two other books, depending on the time of year and what I’m looking for. I often bring more books and leave them in the car, such as Matthew Wood’s Earthwise Herbals. Field guides are particularly useful for plant ID. What’s Doing the Blooming has traveled with me far and wide. 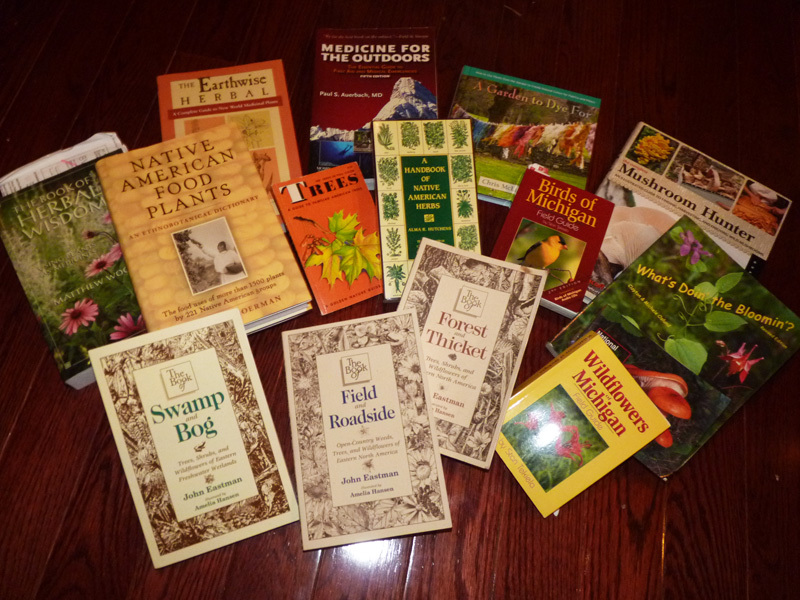 Just a few of the books that help build wildcrafting and foraging knowledge! Understanding Ecology. John Eastman has written a really good series of books on the place of many plants and trees in the ecosystem; and I highly recommend these works to anyone who wants to learn how to forage ethically and responsibly. Why? Because if we are going to take, we need to understand what we are taking and how what we take fits into the ecological system–what insects or animals depend on the plant, what other plants are typically found in the area, and so on. This is knowledge that our human ancestors intimately knew, and if we are going to engage in these kinds of activities, we too must understand it, first and foremost. The three books I’ve read from cover to cover that provide this information are: The Book of Forest and Thicket, The Book of Swamp and Bog, and the Book of Field and Stream (they are the three tan/white books in the front of the photo). Honestly, this is a good place to start even before you begin gathering anything. Wild Foods. If you are going to be looking for wild foods, I recommend Sam Thayer’s books: The Forager’s Harvest and Nature’s Garden. They are both available from his website (he self-published them, and they are the best foraging books I’ve ever read). I often have them with me out in the field and I study them when I’m not out and about. General Plant ID. For flowers, there is a great and compact book called What’s Doing the Blooming? and its super useful for all manner of blooming plants (good for wild food, medicine, and even dye plants). Blooming plants are often fruiting plants later in the year, so you can identify them early in the season using this. Otherwise, any field guide with photos should be sufficient–there are some produced by the Arbor Day foundation on trees that are also useful. Medicinal Plants. I took a four-season herbal intensive with Jim McDonald and that’s how I learned to ID many plants. I combined this with Matthew Wood’s two volumes, The Earthwise Herbal (vol 1 and 2). Usually if I need to find a specific plant, I’ll study it before I leave the house, locate it in one of my field guides, and then try to find it when I’m out. 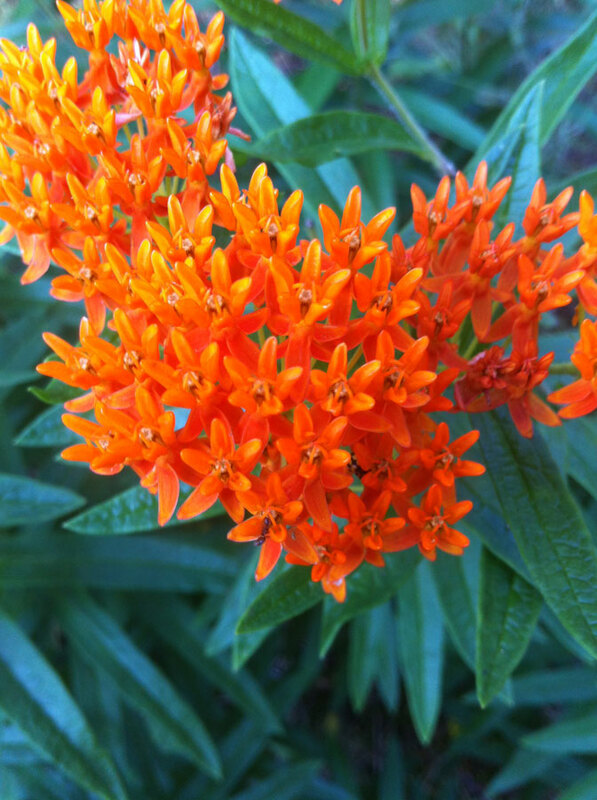 Butterfly Weed / Pleurisy root – an awesome plant for medicine but also very needed by buttefly populations. Harvest with care and only when in abundance. Dyes. There are numerous dye books and mushroom dye books that are also useful if you are going that route. Some that I like are: Dean and Cassleman’s Wild Color and Bessette and Bessette’s A Rainbow Beneath My Feet: A Mushroom Dyer’s Field Guide. Only some of my knowledge on this subject came out of books. A lot of it came from learning from others–I walked at my grandfather’s side and later, my uncle’s side and they taught me much about plants as a child. Much later, I attended a full year of my friend Mark’s “Eat Here Now” classes where he did a monthly plant walk at various locations. I attended several mushroom hunting workshops to learn the mushrooms (and would like to attend more). 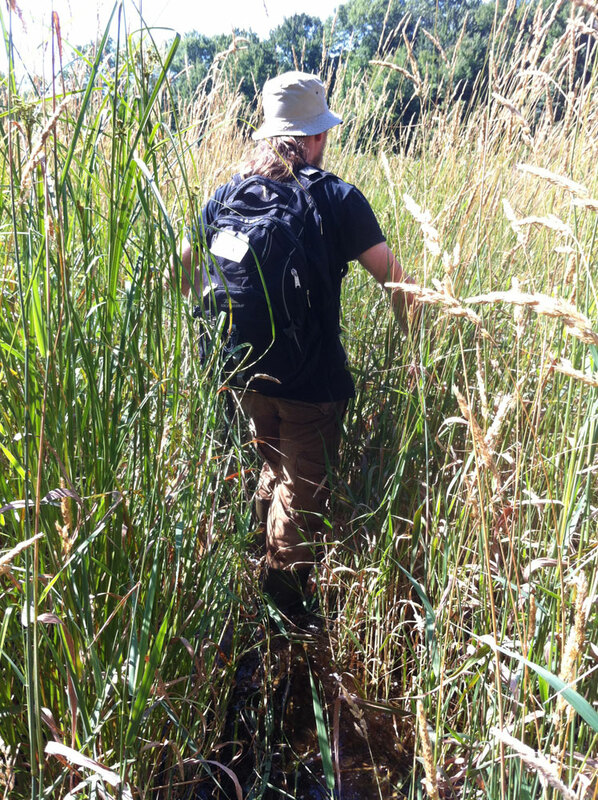 And of course, I attended my four-season herbal intensive (which included one day per month of plant walks out in the field). I also went out with others who knew different kinds of things and we learned from each other. I talk to people about plants often–and am always ready to learn something new or teach someone else. I have found that focusing your energies on one area can lead you to success and allow you to, over time, build a very diverse set of knowledge about things you can wildcraft. Now, when I got into the woods, I am ready for anything–crafting supplies, dye plants, medicine, wild snacks, and treats, wood to carve, and much more. I focused my energies each year on learning a different set of things and adding to my repertoire–the first year, it was mainly art supplies and incense making–I gathered resins and found every berry I could and tested its dye and ink capacity. The second and third years, I focused on learning all of the wild foods I could and kept looking for dye plants and such. 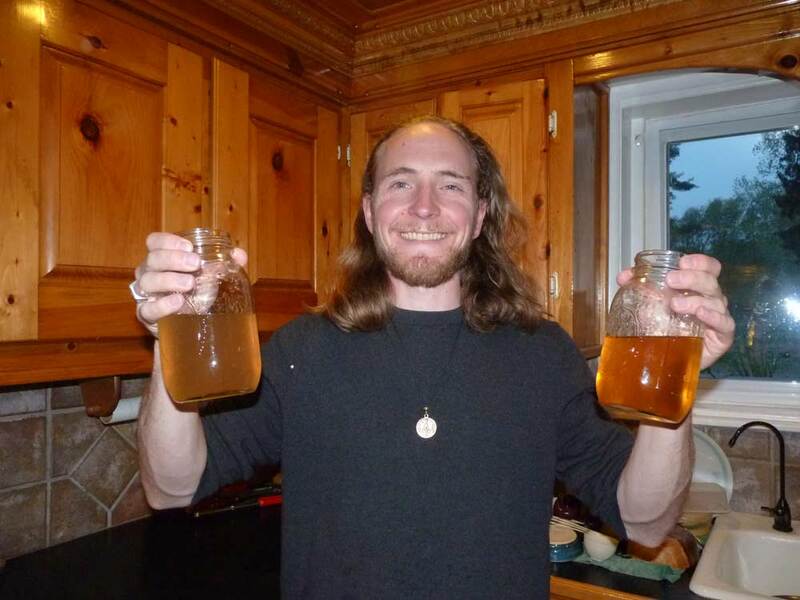 The fourth year, I focused on wild mushrooms and brewing, in addition to food and craft/dyes. Finally, this year, I added medicinal herbs (and will probably continue to focus on them for some time). I made it a point to go out into the field at least six times a month looking for what I was looking for and also paid attention to what was already growing at my homestead. Its also a good idea to learn characteristics of plant families — the book called Botany For Gardeners, recommended to me by Karen (one of the frequent readers and commenters on this blog–thanks Karen!) can really be of assistance. This way, you can begin to identify plant famillies and even if you find a plant you don’t know, its features will give you some clue as to other related plants. A final point about building knowledge–one of the first things you should learn is what can cause you harm. I think first-time foragers should all learn to identify poison hemlock in ALL of its stages before anything else. Poison ivy gets a lot of notoriety, and frankly, can give you a bad rash and a few unpleasant weeks. 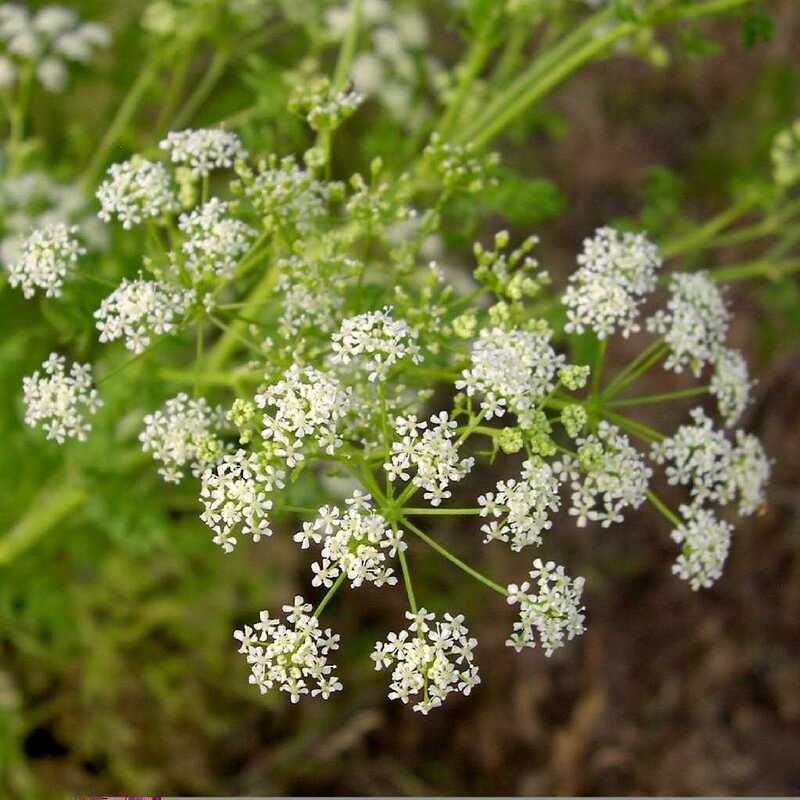 But Poison Hemlock WILL KILL YOU if ingested–and it has many look alikes in the Apiaceae family (such as Queen Anne’s lace/Wild carrot). Even just touching or smelling Poison Hemlock can cause nausea, dizziness, and disorientation. Recently, I was officiating at a friend’s wedding. The bridal party were getting ready to pose for photos along a bridge on a trail. I saw a huge patch of it right where people were standing and watched someone reaching down to touch it (it was pretty, in full bloom). I quickly pointed it out and had everyone move to give it the respect it was due. Interestingly enough, a few months later, one of the people in the bridal party reached out to me to learn more about this plant and many others. Other plants I would learn quickly include the death angel/avenging angel mushroom, poison sumac, and poison oak. When you start looking for particular plants, also be aware of what plants may look similar to the plant you want ( a good foraging book, like Sam Thayer’s books, will teach you this). Truthfully, the better question is–what can’t you wildcraft? I’ve taken particular joy in learning as much as I can about as many plants as possible and their uses. For example, see my extended post on the dandelion. One of the things you want to ask yourself is–why are you wildcrafting? For medicine? For Food? For crafting? This will determine, to a large extent, what you are looking for and what resources you will need. You also want to consider the abundance of the plant and who else may be depending on the plant as a food source (more on this in Part II of this series). Setting your intent: Wandering vs. Targeted Harvesting. Sometimes I go out wandering to see what I can find, while other times, I have a very specific harvest in mind. Determining this will indicate where I should go (e.g. a few days after a “weather event” to look for mushrooms; to the outskirts of a housing development to pick serviceberries, and so on). If I don’t have anything in mind, I will go to one of several wild areas and make it a point to return to the same area multiple points in the season to gauge how the crops are progressing. When you are first learning, the other thing is that you might not know where to get certain things. These “wanderings” then, while time consuming, are wonderful times of discovery. They help you establish your “spots” for future harvests–look for abandoned apple orchards, berry patches, abundant fields, and so much more. 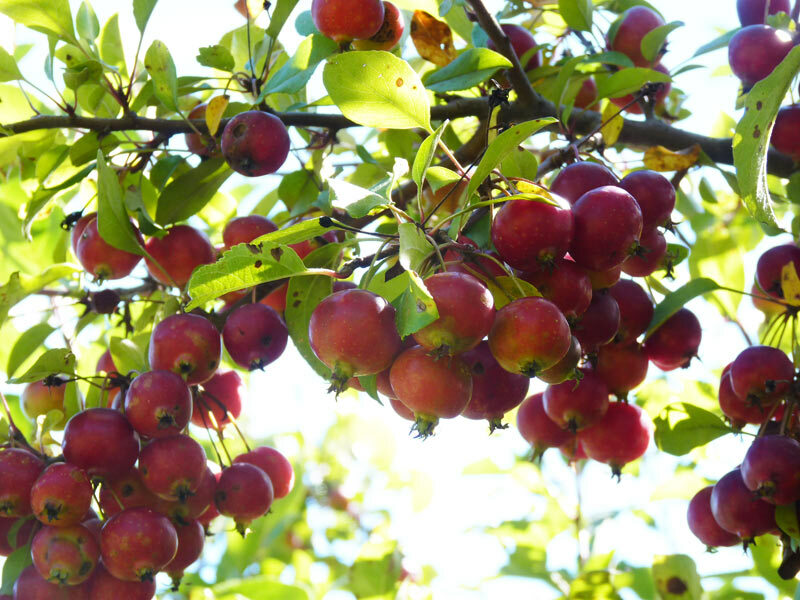 Nature’s bounty – the crab apple! Keeping records. I keep fairly detailed records of harvests and locations. I know others who draw extensive maps so that they can find their mushrooms again the following year. All of this is useful as you are learning–looking at your records from one year can help you figure out the locations and timing of where you want to go. Timing is a tricky thing in wildcrafting. Generally, the more often you go out, and the more time you devote, the more impressive harvests you will find. Each year can be its own wonky thing, and you can never be sure that the wild blueberries will be blooming at the same time (they, like everything else, can often vary by several weeks depending on the weather) I find its better to visit early in the season and stop back often for things you really like than to miss the harvest entirely. 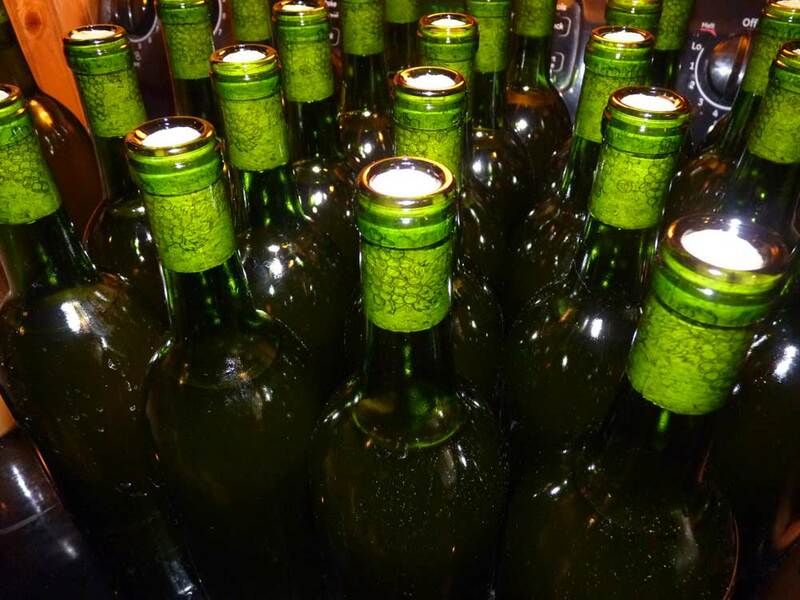 For example, as I mentioned in my dandelion post, each year there is about 7-10 days of “peak dandelions” where they are blooming and abundant–and this is really the only time to make wine because its the only time they will be in the volume you need. If you miss the harvest–you’ll have to wait till the following season. The other important thing about timing is that not everything is abundant each year. This is why we must take advantage of harvests when we find them and understand how to stretch those harvests out in times of scarcity. I remember, for example, the great apple harvest of 2013; the great st. john’s wort harvest of 2014, and the great berry harvest of 2011 and 2013 (and the lack of any berries to speak of in 2012 and 2014!) Canning, drying, freezing, and other forms of preservation can allow us to enjoy the bounty even in years of famine. A lot of people, as i mentioned in my earlier post, don’t really understand this. The supermarket is always abundant, and if you are going to share wild foods with them, I would suggest making them come with you on a trip or two so that they understand the work of it–and also the joy. Stay tuned for my second post next week, where we’ll delve into understanding the ethics of foraging, discussing where to harvest safely, and more! I’ve been studying mushrooms for a while now, but this is the first year I’ve had the opportunity to harvest and eat fresh mushrooms that I’ve picked myself! Honestly, there are few things better in this world than a fresh Chicken of the Woods (Sulfur Shelf) mushroom. I have had Chicken of the Woods only once before, and have oggled them in books many times, but this year was my first chance at harvesting them and enjoying them fresh. 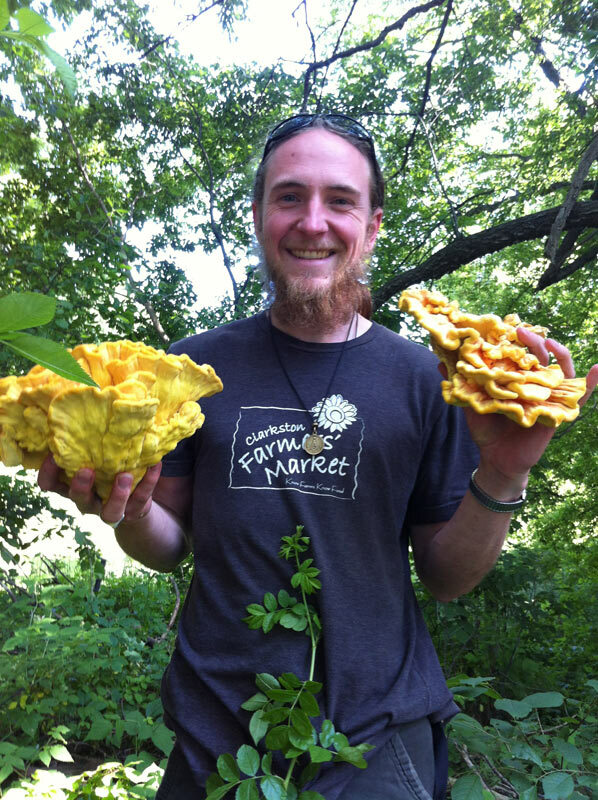 Chicken of the woods, I was taught, is one of the “foolproof” mushrooms, in that its a beginner mushroom that is easy to identify and tastes delicious. Last week, a friend and I were driving down the road when he spotted it–a bright mass of mushrooms, 5 or so feet up the trunk. Excitedly I stopped the car and we got out, laughing and rejoicing at our lucky find. 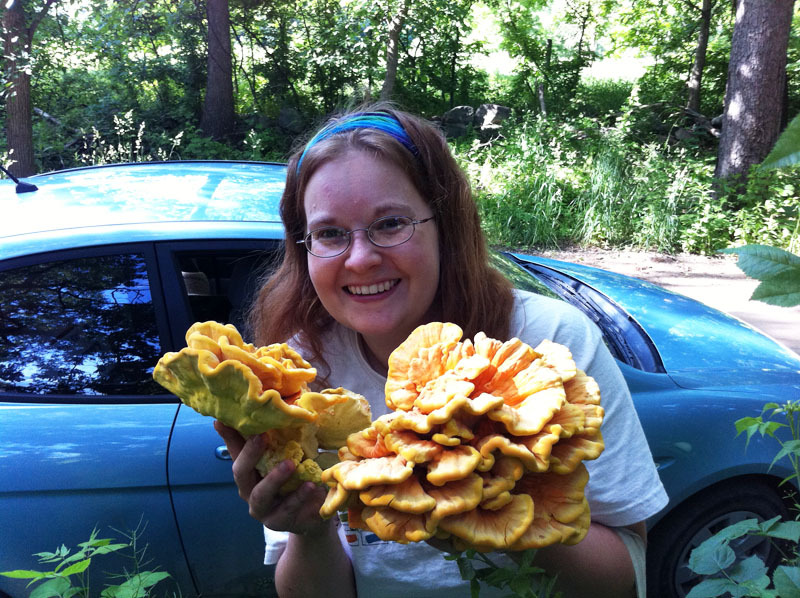 After confirming that the mushroom was Chicken of the Woods, we took pictures and carefully harvested the mushrooms. Here we are! 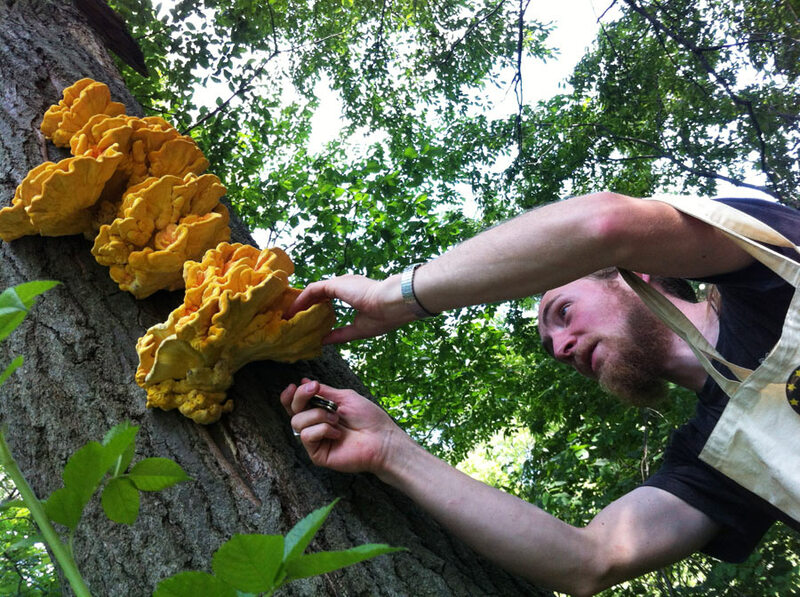 Me and Chicken of the Woods! Paul with freshly harvested chicken of the woods! 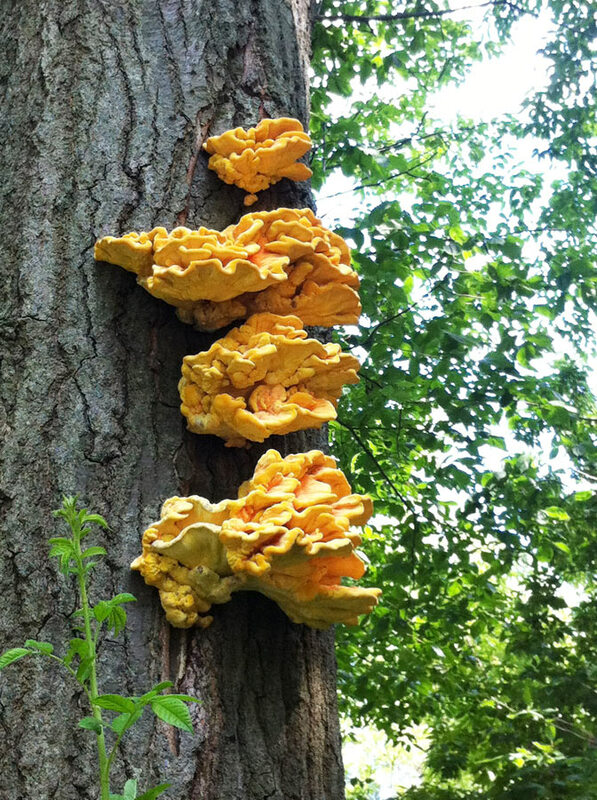 Chicken of the Woods most typically grows on dead oak trees. The tree identification is actually really important for this species; there’s a very similar variety that grows on dead hemlock trees that can cause stomach upsets (more about that here). Where I live in Michigan, however, we have an abundance of oak and no hemlock, so we are in good shape in terms of finding these rare gems. For more photos of the mushroom itself, you can go here. After we harvested the delicious Chicken of the Woods mushrooms, we took it back to my house, cleaned it up, cut it up, and ate a bunch of it (and froze some more). These freeze well and can go into many different dishes. They honestly do taste a lot like chicken and have a wonderful meaty texture! I’m going to be doing a series of posts on wild foods, especially those that I’ve been gathering for a long time. Why wild foods? Wild foods are just that–they grow without cultivation, are delicious, and allow you to experience different kinds of flavors. When gathering wild foods, you want to make sure you are gathering in a sustainable way (in other words, don’t over-harvest and make sure you have permission–of all kinds–to harvest). My good friend Mark put together this awesome guide on ethical foraging–please read it before harvesting any wild foods! 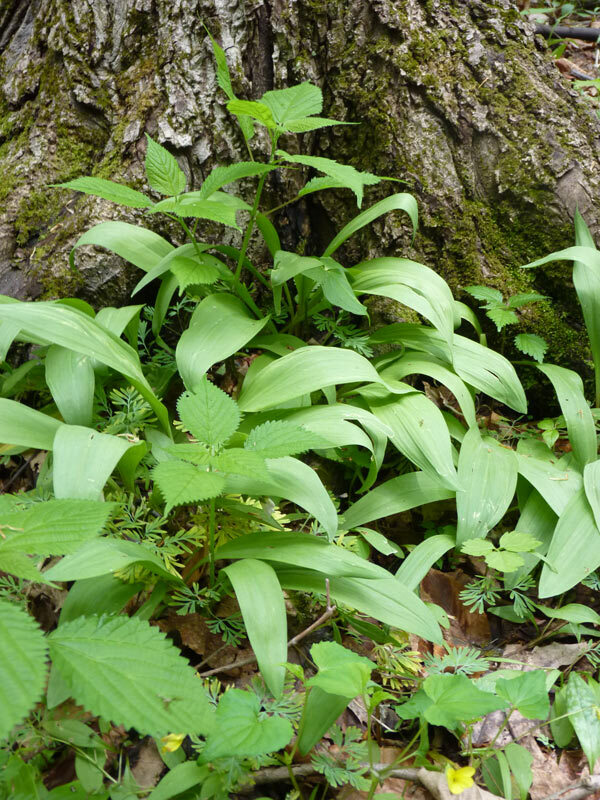 The first wild food I’ll be discussing is: RAMPS! 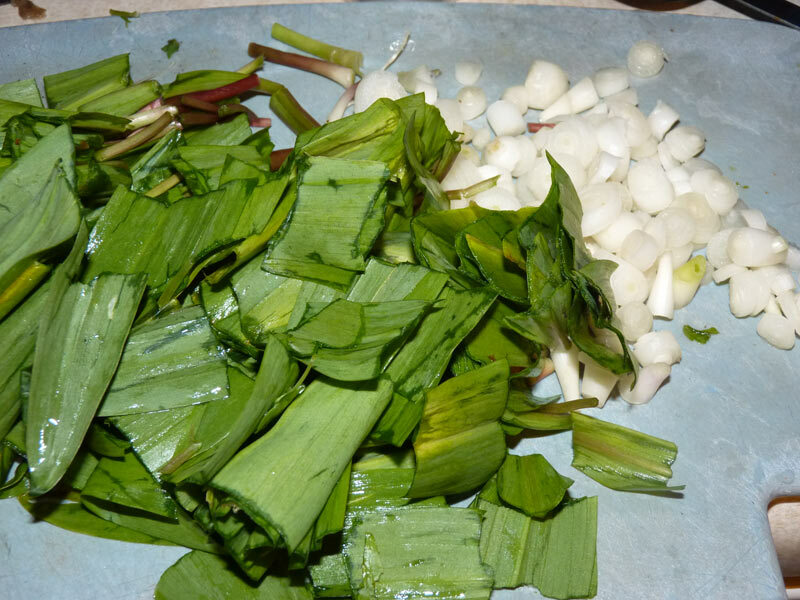 Ramps (with wild nettle and other plants). The ramps are the green ones bending over slightly. What: Ramps are a plant native to North America (specifically, the eastern seaboard and Midwest regions). They taste like a cross between garlic and onion, and as the season goes on, Ramps take on stronger and stronger flavor. Ramps have a single bulb (which smells of onion/garlic and is quite unmistakable), two broad green leaves coming up from the bulb (the greens are also edible). Later in the season, the ramps will turn yellow and eventually produce a seed head (which produces black seeds and looks a lot like a chive head). Apparently, they have become commercially available in recent years, which I guess is a testament to their awesome flavor. Where: Ramps can be found in wet forest areas. 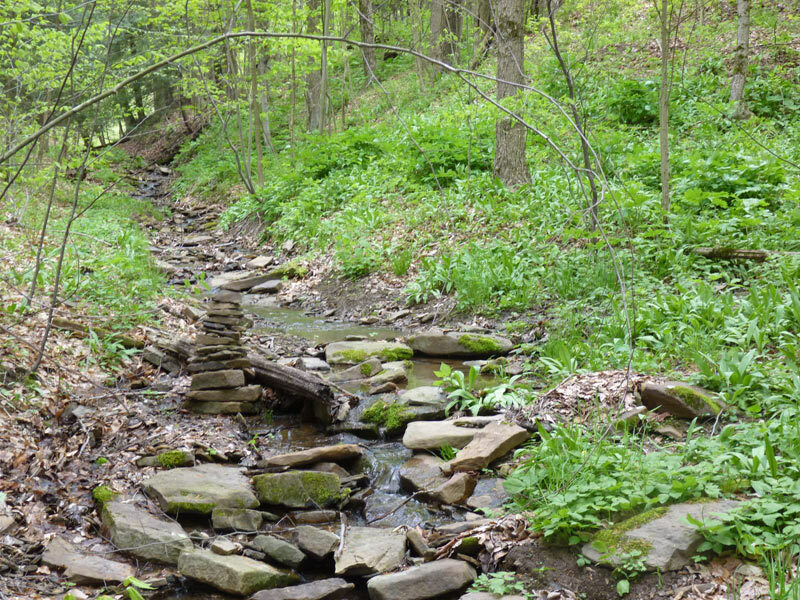 They especially like to grow in valleys where spring rains cause small springs to pop up–this is where I always find them. Look also along riverbeds and on the edge of marshes. They are a full shade, deep forest plant. Typical place to find ramps. Note: the druid has been here before and left a shrine! When: Ramps come into season usually in late April or early May. Depending on the warmth of the soil, they might come in a bit early (as was the case last year) or a bit later (as was the case this year–they were at their peak in the 2nd week of May this year) depending on spring weather. What to harvest: The entire plant can be harvested anytime before it goes to seed. Once the plant is in seed (known as “bolting”) the energy of the plant shifts from the leaves and bulb to the seed production, so the flavor suffers. Ramps chopped up and ready for eating! 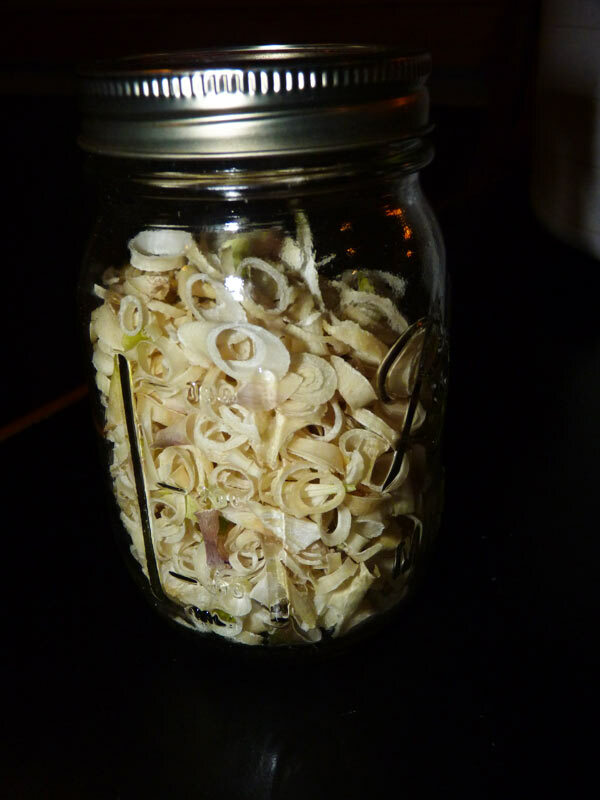 How to Preserve: I’ve only attempted one preservation method, which is drying ramps in a dehydrator. They dry very quickly (4 or so hours) and break up into neat little rings. I highly suspect that they would store decently well in a root cellar. I’m also told they freeze well! How to Eat: You can use the green leaves in any way you would a green onion. You can use the bulb like an onion or garlic. The photo below shows a wonderful fried rice dish that we made from wild woodland nettles (post on that soon), ramps, rice, and egg. It was divine! 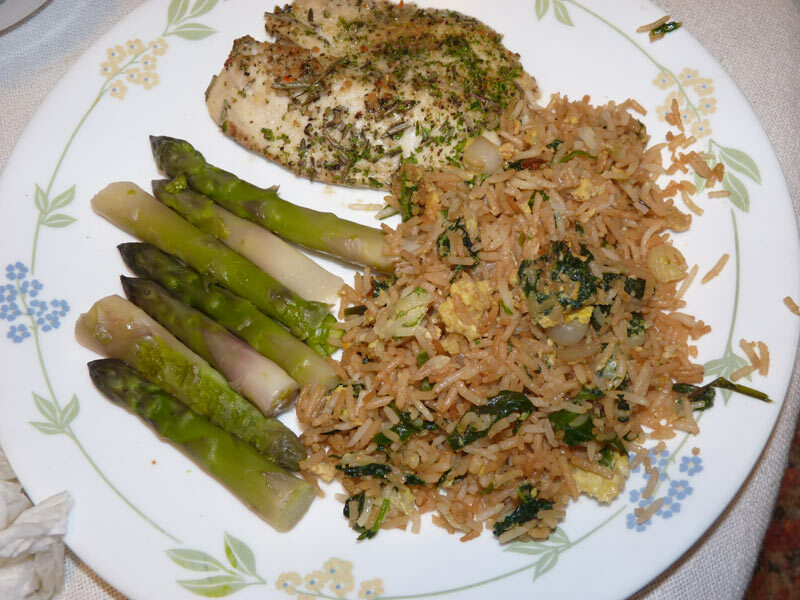 Ramp stir fry with fresh asparagus and fish.